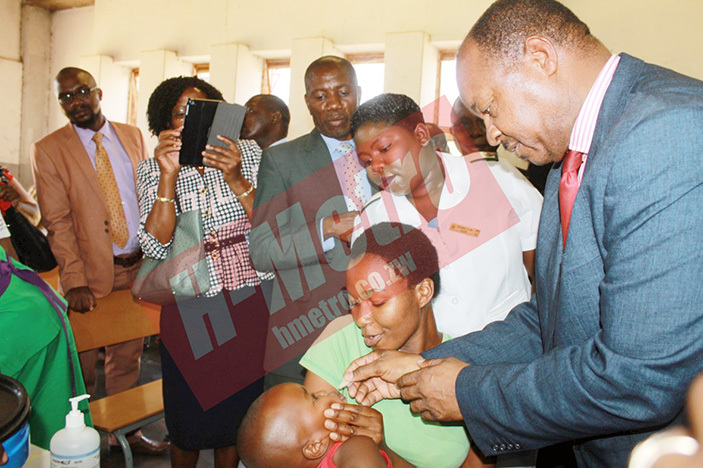 MINISTER of Health and Child Care has launched the National Oral Cholera vaccination campaign in Budiriro where more than 500 000 residents from Budiriro and Glen-view suburbs are set to benefit from. The dose is suitable for persons above one year and it protects individuals from contracting cholera for the next six months. 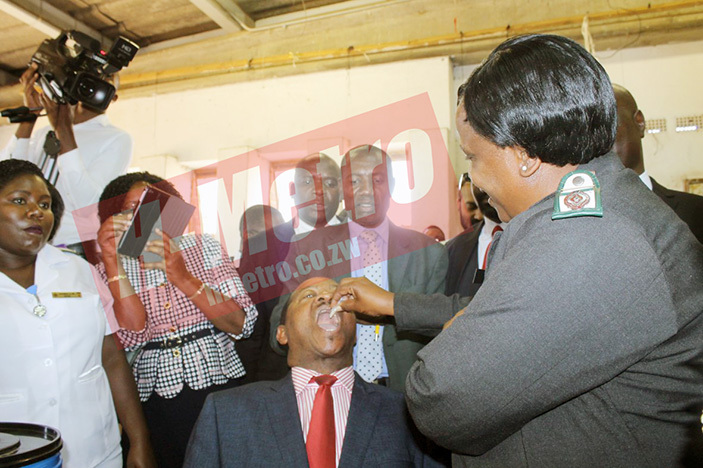 At the event, Minister Obadiah Moyo led by example by being the first to take the oral vaccination followed by Harare Mayor Herbert Gomba who was also present at the event. Speaking at the launch, Minister Moyo emphasized on the need to maintain hygiene in the fight against cholera. “We all need to fight cholera bearing in mind that cleanliness is next to Godliness. “We can achieve this if we unite in fighting the disease, we start fighting cholera by keeping ourselves and our environment clean. “The water that we drink should first be boiled or should be treated water,” he said. Minister Moyo also applauded local and foreign organisations who are assisting the government in fighting cholera. “When Cholera was declared a national disaster we have both local and foreign organisation who are assisting out Ministry in fighting cholera. “We are the people who are being assisted and we should be grateful for the support we are receiving from all sectors. “Our President and the first lady as well has donated money in fighting cholera and we should be thankful for that,” he said. Doctor Moyo added that the vaccination program was an ongoing exercise where more vaccines are set to be distributed the whole country. “We are starting this program in providing vaccines in Harare and mostly in Budiriro and Glenview because Harare is the epicentre of the cholera disaster. “On top of the 500 000 doses we currently have we are expecting another 900 000 which we will be distributing in different suburbs. Minister Moyo also paid tribute to the forty nine people who passed away from Cholera. “We want to pay our condolences to the forty nine people who died of cholera, and to us who are still alive let’s do everything we can to ensure that we prevent cholera. “What we are doing are short term measures in fighting cholera but term measure involves improving our sanitation as a country,” he said. Minister Moyo also commended a good working relationship with the mayor in fighting cholera by maintaining cleanliness in Harare. At the event other dignitaries from the Ministry of Finance, Ministry of local government and different local and foreign organisations also followed suit by getting vaccinated.